Candy Stripe Lil has everything ready for her friend Harry the Hog to come visit for afternoon tea. She has made all of his favourite snacks – southern-fried lizard, barnacle sludge, chocolate-chip beetles, slug-flavoured chips and more – but as the clock strikes three, Harry is nowhere to be seen. When Harry still hasn’t arrived by four o’clock, brave Lil heads out into the fog to make sure Harry isn’t lost. Along the way she meets other animals, who are sure they haven’t seen Harry, but they offer to help Lil search in the fog. Together, they wander until they find something stuck in the mud. Is it Harry? The new friends will have to work together if they want to find out. This delightful story about friendship by Julia Copus is filled with a gently flowing rhyming text and some wonderful sound words as the different animals move through the fog (pittery pattery, tippety tappety, munch crunch, tac tac tac). The illustrations by Eunyoung Seo are just gorgeous, with the outdoor scenes shrouded in a mysterious blanket of fog. 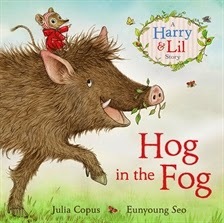 Hog in the Fog, with the wonderful rhyme and rhythm of the text and potential for dramatic sound effects, is ideal for reading aloud. The unusual selection of afternoon tea ‘treats’ will make children giggle and the story itself will reinforce the familiar messages of looking out for our friends and working together. A beautiful story sure to be enjoyed by young children and adults.